Baking is so different from cooking. When you cook, you usually get the chance to add a bit of this, a bit of that until it’s just right. But with baking, you create a whole batch of something, set it in the oven, and pray that it works. There’s no adding a teaspoon of sugar and then putting it back in the oven. It’s done. So then you give it a second run. A third. Success in baking takes time. Dedication. Experience. Obsession. People will tell you, “Just give up. Move on to another recipe. This one is a failure.” Others will be positive and encourage you to keep going. Wait, are we talking about life or a muffin recipe? 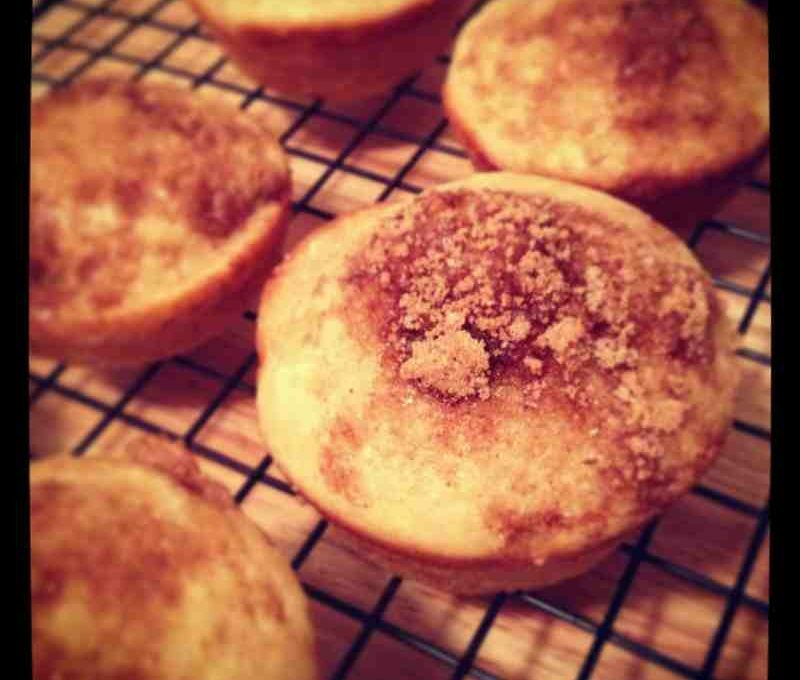 Back to the coffee cake muffins. The original recipe was promising, but something was missing. It needed more moisture. More spice. So that led to version two (more spices). Then versions three (addition of Greek yogurt), four (less yogurt), and finally, five (even more yogurt!). Version 3 – The batter was too runny and soaked up the brown sugar crumble topping! I’ve never gone to culinary school. Haven’t taken a cooking class. I almost always skip over recipes that call for any type of flour but all-purpose. When I met my husband a decade ago, I could barely make a decent pot of chili. But something told me to take on this muffin recipe and make it better, make it delicious, make it MINE. You don’t have to be a skilled cook or baker to go out on a limb in the kitchen. Success doesn’t come from negativity or fear. When no one else believes in you – or your culinary prowess – believe in yourself. Mix dry ingredients in one bowl. In a second bowl, combine butter, yogurt, vanilla and egg. Stir wet ingredients into dry and then add the milk. Batter will be fairly thick. Fills each of 10 muffin cups about ¾ full. 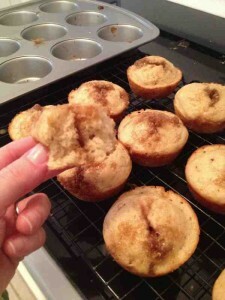 In a small bowl, mix about 1/4 cup brown sugar and a good sprinkling of baking spices (to your taste). 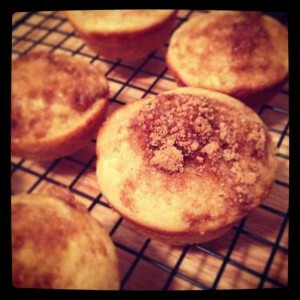 Top each muffin with a good helping of the brown sugar topping. Bake at 350 for 13 to 14 minutes. The top of the muffins should be springy. Remove from oven and allow to cool/finish baking through in the pan. Transfer to wire rack to finish cooling. Try not to eat all in one sitting. UPDATE: These muffins do not freeze well. They’re best right out of the oven! What are your unexpected kitchen triumphs?